Ensure your business abides by the current regulations and laws with this Health & Safety Law Poster. 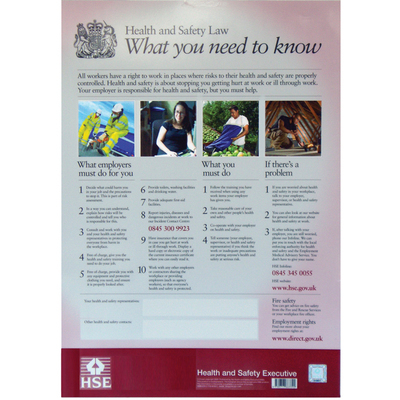 Outlining the British health and safety laws in operation at this date, this durable poster has a laminated finish for long lasting display. Easy to read and follow with clear pictures, the durable safety law poster can be displayed in either suitable frames or on it's own around the workplace. The thin design blends in easily with the other signs around your business while also being pliable enough to mould to your required surface. The information details explains the correct procedures to your employees and also has a section suitable for documenting the name and details or any safety representatives or contacts required. Here at Gompels, we have a wide range of signs available for all your professional needs. From our Bedroom Identification signs for residential homes through to No Smoking signs for your office, our signs are all manufactured to a high quality and available at exceptional, wholesale prices.